Over 100,000 people celebrate Canada’s birthday in Surrey. Our festival features two stages, the Shooting Stars Midway, great food, and plenty of interactive activities for all ages. Past headliners include Colin James, 54-40, Loverboy, Trooper, Lisa Brokop, Honeymoon Suite, Kim Mitchell, Bif Naked, Ian Tyson, ODDS, Stereos, Dragonette, Dan Mangan, You Say Party!, Charlotte Diamond, Bobs and Lolo, Elise Estrada, En Karma, Jessie Farrell, Ridely Bent, and many more. Stay til the end and experience the Fireworks Finale. 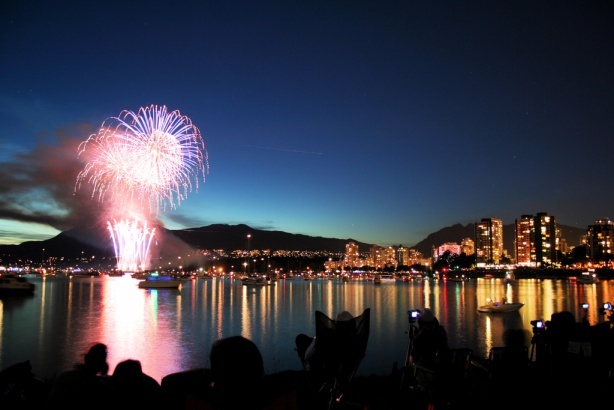 The spectacular Surrey Canada Day fireworks display will light up the sky again in 2012. Set to the mash-up mix by DJ Head Spin, this show will close out a day filled with Canadian pride. For the best view of the fireworks, we recommend being on the field of the Cloverdale Millennium Amphitheater, looking above the Chevron Mainstage.